Last year I wrote a post – I read the news today, oh boy – in a “day in the life” type post to help people understand what I do all day. I was thinking about that post this last week for some reason and I decided I should do it again. The last time was in May of 2012 which now seems ages ago! I probably had no idea what I was doing! I sort of know what I’m doing know so I think it would be fun to compare and I took copious notes this year. These types of posts for librarians have been going on for a while so perhaps you will be bored, but it’s helpful for me sometimes to see what I’ve done all day. There are days where it seems like nothing gets done and I feel like I’m working. It’s a mystery really. Picture unrelated . . . I just like it. So, here was my day last Wednesday. I was scheduled 10-6 and Wednesdays are generally one of the days where I get a good amount of time off the public service desk to work on some YA stuff. Here goes! 10:15-11:00: Checked Gmail and work email accounts; checked off things accomplished from yesterday’s to-do list; cut out multi-colored paper stars for a “starred recommendations” display using our sweet die-cut machine; and cut out die-cut snowflakes to decorate the YA space, too. 11am-Noon: Fixed a flyer for our upcoming Skate & Read community partnership program thingy and printed out copies; printed a portion of the flyers I send to the public schools; talked with a circulation desk coworker about some issue I missed the day before (I’m not telling, you nosy Nancy); checked the Etsy order status of the vinyl decals I ordered for the YA space; ordered window paints from Amazon for the teen space; and chatted with the head of Tech services about ordering a cake for our Skate & Read program in January and asked a question about the billing of some of those book purchases. 1-2pm: Fixed a Firefox tab/browsing history issue for the head of Tech Services*; created a flyer for our March author program by Leslea Newman (March 13th at 7pm! You should come! ); looked up how many summer reading incentive things I bought last year so I could get comparable numbers for this year and picked the prizes that my Teen Advisory Group liked the most when I asked them to help me choose. 2-2:30pm: Lunch! I was reading Belle Epoque. 2:30-3:45ish: Did a bit of research on Belle Epoque since I may get to interview the author, a Morris award (best debut YA author award from the ALA) finalist; emailed a few contacts at the schools with the Leslea Newman flyer; went upstairs to gather up my books for the “starred recommendation” board for the windowsills of my teen area; taped the stars onto the books and wrote the reasons why I thought the books were “stars” – basically just the books I really like and want lots of teens to read! 4pm-6pm: Worked at the Main Desk checking in and out books, answering the phone, putting items on hold, filling in statistics for previous programs, helped patrons find books, etc. It’s hard to write what you do at the circulation desk. It’s busy! 6pm: Home time! I listened to A Feast for Crows on my drive. I’m really ready for Dance with Dragons – I need less of the Ironborn in my life. That’s it! A day in the life of a young adult librarian! I just ignored those warnings…. Always remember to clear your browsing history and cookies, too. I like the following one, too, though sometimes I’ll admit your questions are strange. 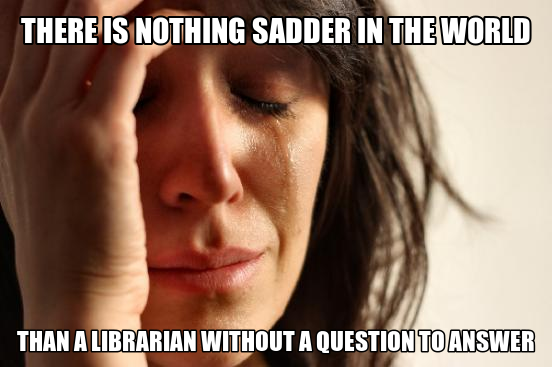 For example, when you call in to ask if the library is open and I respond that it is and you ask me if I’m sure? Yup, those are the times I’d really rather you not ask me. Krista–You’re not anonymous! 🙂 And I bet you’re an awesome boss. Picked up feast of crows in the library… and then put it back yesterday – but I hope to read it soon! I really want to finish reading Telegraph Avenue and Brothers Karamazov and have both going simultaneously right now – such a jumble of lots of reading to suit my crazy end-of-semester mood. Just wanted to drop in and let you know that I’m still reading and loving your posts. Thank you! I really appreciate it. Punnett squares were one of the things I REALLY understood in high school bio so I have a special place in my heart for them. Hope you are doing well!